I kind of have a thing for the Saarinen Tulip shape. I grew up with a Saarinen Tulip table and chairs thanks to my mother's good modern sensibilities. You can't really make this out but I am leaning on a Saarinen Tulip Table (trust me) and displaying a California Mission. Um yes, that is a Nelson Saucer Pendant Lamp above me. And my hair is parted STRAIGHT down the middle. Fourth grade so this puts this photo square in the middle of 1972 (you do the math). I have long admired the elegant tulip bases on the Saarinen chairs and tables. I haven't really been able to work them in until I spotted a post from Dana@Mid2Mod -- a friend of hers was downsizing and selling some of the contents of their home. And there I saw it. A tulip stool. Dana kindly responded to a few emails explaining to me the going rate for these tiny treasures, and that her SIL would keep his eyes open. 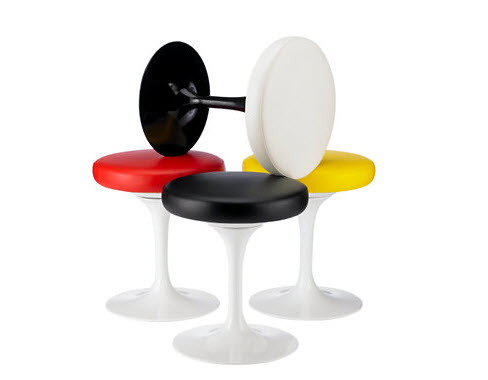 Meanwhile I scavenged eBay for tulip stools. These little beauties aren't cheap ($350 and way up for the real deal). Plus obscene amounts for shipping. And many knock offs abound. Condition can be iffy. The tulip bases are metal and rust issues abound. Dana mentioned that that the stools are still be manufactured by Knoll. Design Within Reach opened a showroom up near us and I happened by one day. $855. Gulp. Not doing it. Plus the standard covering is vinyl. Any of the other Knoll fabrics could increase the price by $100 to $200. Ugh. Back to trolling eBay. Finally, I found it. And the price made sense as the seller was not trying to make obscene amounts of money. Their shipping was also only $25 USPS - completely reasonable. Additionally you can see how well wrapped the stool was. I had the perfect spot for it all picked out -- the show piece of the three newly remodeled bathrooms (the one with the tub of course). And this little stool is in as perfect condition as possible after some forty or fifty years. My research had paid off in that I at least knew now how to identify a real vintage Saarinen stool. For some reason the "BR 51" imprint in the base is critical. And below you can see the missing the furniture tag label but the spot for it is visible. And the Knoll label is still on! We have some minor chips on one edge and a little scratch on top. I don't mind. Patina. Plus the aqua is a great accent color in the largely neutral bathroom. The fabric on top is original. The seat still swivels quite easily too. The only negative is the foam has gone pretty hard. But I don't care. For once, I took my time, researched and waited. And it paid off. Thanks Antiqwitty. Nice transaction. A little aqua punch indeed. I agree with you - the aqua is a great pop of colour in your lovely bathroom. What a fantastic find! I didn't know a tulip stool existed! Good thing I have people like you and Dana to keep me in the know. I love the tulip stool. I am now patiently trolling for a second. Looks like kitty likes it too. Good job in finding it. She cannot hide behind a tulip. I have an Eames Management chair that has almost the same coarse deep green fabric as that stool, and I'm looking for a Saarinen stool! Nevertheless, good find, enjoy!